Most moments at the farm are mundane, but Mike finds the everyday work and community here satisfying. Mike grew up in New Bedford and Wareham. Although not a farm kid, his dad kept a garden and they spent a lot of time outdoors exploring the pine barrens and beaches of southeastern Massachusetts. His experiences in nature lead to his major in Plant and Soil Science at the University of Massachusetts. 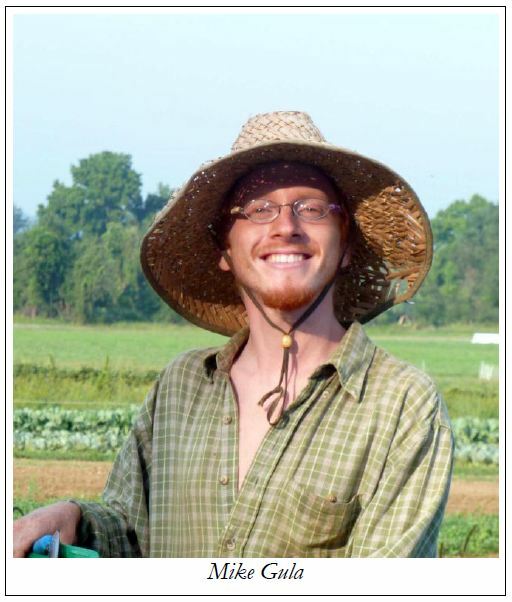 While at UMass, Mike was part of the Student Farming Enterprise, and this gave him a good basis to dive into the work here. However, our scale and degree of mechanization, and the livestock are new aspects of farming for him. He appreciates the work that can be done with tractors more than he had expected, and especially likes his assigned tractor, the Deutz. This tractor is used for field cultivation and transplanting. He also really likes the livestock, especially the pigs – their ability to use their faces as shovels to root around for food impresses him, and how happy and alert they seem. In addition to farming, Mike has experience working with young children. He worked at the UMass campus preschool, where he learned what it means to be patient. According to Farm Kids Jesse and Tim, he also must have honed his ability for children to find him “awesome.” Compared to farming, he found being a preschool teacher more tiring. He had the opportunity to continue teaching, but decided that he wanted to delve into farming. After this year, he plans to continue farming, and hopes to eventually run his own vegetable farm.